Quick Base Visual Builder provides an alternate way to create and update apps. 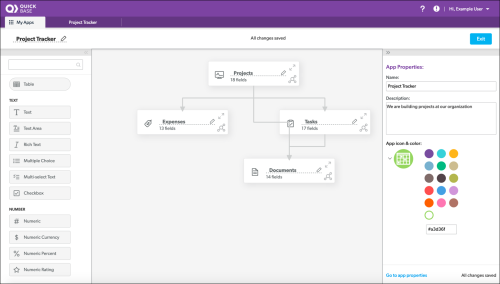 You can create tables, add fields, and connect relationships, all by dragging and dropping items onto a canvas. Using the Visual Builder, you can test out configurations to determine the best data model for an app. You can use Visual Builder to create a new app or to update an existing app. On My Apps, choose Create new app. 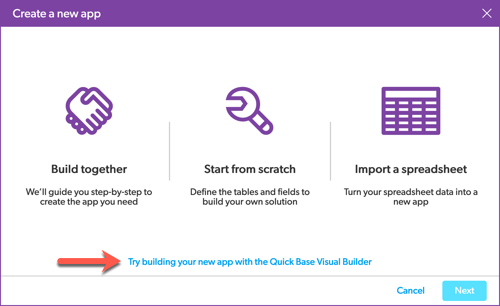 At the bottom of the dialog, choose Try building your new app with the Quick Base Visual Builder. You can use Visual Builder to name your app, choose an icon and color, create tables, fields, and relationships for your app, then choose Create app in the top right. Note that when working with an existing app, changes in Visual Builder are saved immediately. When first trying out Visual Builder with an existing app, you may want to use a copy of your app. In Settings, choose App management. In App management, choose Show Quick Base Visual Builder. Connected tables. You cannot use Visual Builder to add connected tables. The Visual Builder shows existing connected tables in your app and you can add normal fields, but you cannot add connected fields, make modifications to connected fields or adjust connection properties. Summary fields and lookup fields. Visual Builder may add some lookup fields for you automatically during relationship creation, but you cannot currently use Visual Builder to add summary fields or lookup fields to a relationship. You can exit Visual Builder to edit the relationship, adding summary fields or adding or editing lookup fields. Cross-app relationships. While you can use Visual Builder to create table-to-table relationships within an app, currently you can’t view or create cross-app relationships. Formula field properties.You can use Visual Builder to add formula field types to your tables, but currently you cannot create or edit formulas or change other properties within Visual Builder. Multiple choice and multi-select text field choices. While you can use Visual Builder to add or view multiple choice and multi-select text field types, currently you cannot add or edit the choices for these fields within Visual Builder. Number of tables limited to 80. Currently, if you try to open an existing app with 80 or more tables, a message appears preventing you from opening the app in Visual Builder. If you are using Visual Builder and add an 80th table to your app, a message appears preventing you from adding that table.